I teach mathematics but I often connect it to other subjects so that students can better relate to it. In a recent class in an attempt to connect mathematics with everyday life I decided to seek the help of economics. I took my students to the super store Best Price to help them understand the relationship between profit, selling price, cost price, discount, marked price, and loss; all of these are a combination of numbers and economics. The trip had a lasting impact on the students as they understood the logistics related to trading, variation in prices, wholesale and retail selling, procurement and disbursal of commodities, demand and availability, etc. The visit also helped integrate mathematics with other subjects like biology, agriculture, economics, geography, management, etc. The students were taken around the huge store and nearly every wing was explained in detail by the staff at Best Price. The students’ questions were answered amicably. The students calculated the percentage of discount offered and compared it with wholesale prices. Thus the commercial aspect of the subject was well understood. “We found the place (Best Price) very interesting and informative. We gained a lot of information about goods; from getting the raw material to the selling of the commodity. We came to know that the goods we use come to us after undergoing numerous processes. We got the opportunity to see the market price, sales price, discount percentage, and discount rate. We also saw the tax added to some of the commodities. We learnt that (at Best Price) the white card put in front of a commodity displaying its price means that is a general product. The yellow card means that the commodity is the sole production of Walmart (the parent company) and the green card means “case pack” which means that the commodity should be bought in wholesale. We also came to know that promoters from different companies come to promote their brands. The prices of all the commodities are changed three times a day as a marketing tactic. The prices are almost about half here when compared with the retail market. On going to the frozen items section we came to know of the different preservation techniques. There was a large discount in the market price of the vegetables. Tax was added only to those commodities that were not local. 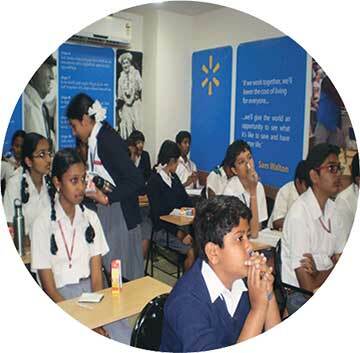 We also learned about other things such as the per day electricity consumption of Walmart, the godown process, etc. Lastly we were also allowed to buy some goods for ourselves. The trip was fruitful as it connected the disciplines of science, social studies, commerce, and math. It was indeed a good learning experience for both the students and me. The students really enjoyed the visit to the store and looked forward to a revisit and sharing their knowledge. The author is a mathematics teacher at Bharatiya Vidya Bhavan’s Public School, Jubilee Hills, Hyderabad. She can be reached at saradasri24@gmail.com.